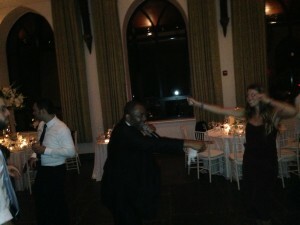 Keith Rockin’ The Dance Floor At The Reception! On Saturday, 8/31/2013, we had the pleasure of playing at Ryan and Sara’s wedding at Wave Hill in Riverdale. This was our first time performing at Wave Hill, and it was an amazingly beautiful setting right on the Hudson River! Sara and Ryan had an awesome day for their wedding. Andrea provided solo piano for their ceremony and cocktail hour, and then The Kazz Music Orchestra played as an 8 piece band for their reception. It was especially fun because they asked us to stick with Motown and Classic Soul music for the whole reception, sprinkled with only a few Top 40 hits like Blurred Lines, Treasury, Get Lucky, and Suit & Tie, so it was a great old school wedding for us! Congrats to Sara and Ryan!